In a recent post, I wrote about a speaker at an event I attended who sang "Over the Rainbow" and completely took the audience by surprise. I loved her chutzpah and her willingness to try something different to get our attention, even though she is not comfortable singing in front of an audience. She inspired me to include singing in one of my presentations. I didn't know how it would happen, and I didn't want to plan anything for fear of being too nervous to pull it off. So this past weekend I took a baby step. At the conclusion of one of the group exercises, I discovered that several people in the room didn't know the song "Auld Lang Syne." If you don't know it either, it's the song many of us sing at midnight on New Year's Eve. So I sang a line of it to jog their memory. Okay, it was only a line. It was no "Over the Rainbow." But I was pleased with myself that I said I was going to sing during a presentation and I did. And because it wasn't planned, I didn't have time to get nervous about it. The irony here is that I used to sing in front of people all the time. I sang in choirs, I sang solo in musicals, I sang in a quartet, a trio and a duo, and basically performed whenever I got the chance. 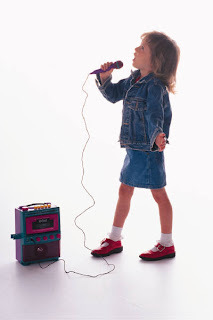 As I got older and got out of the habit, I became more self-conscious about singing in front of people. I won't even do karaoke. I'm no Celine Dion, but I can carry a tune and the dogs won't start howling. So how exactly does this insidious thing happen to us over time, this discomfort with exposing ourselves and fear of taking a risk? Especially around things that we used to do with complete confidence? I don't know, but I don't want to let it control me. So I'm going to try it again. I'm going to find another way to incorporate singing into a presentation. Because it's a challenge for me, because it's unexpected for the audience, and because it adds an element of fun and spontaneity to a presentation. What have you done lately to stretch the boundaries of your comfort zone? I have recently been thinking about how to incorporate some fun dance steps into my presentations as a way to loosen people up and get rid of ego/resistance. It would fit nicely into a lot of the work I do around stress and confidence. I do like karaoke, but I'm more in tune with dance. Nice to know there are others doing similar things. Thanks! It's interesting that the thought of planning it out made you more nervous. I think for some people it would make them less nervous to have it planned out, practiced. Guess you have to find what works for you. But kudos on taking baby steps, that's all that matters. Isn't it a shame that growing older seems to stifle that sense of adventure and fun, and particularly creativity for many of us that would be so useful in endeavors such as public speaking? I remember taking a course on memory (ironically) that advised creating outlandish mnemonic devices to help you remember things. And the instructor said when he taught the class to kids, they had no problem coming up with novel, inventive images, and therefore more effective "markers" than the adult classes. Speaks to your previous reference to adultitis. Anyway, sing it proud! In my observations, the key to success is committing, even if it's goofy, and then others feel safe to jump on board. Keep up the good work!